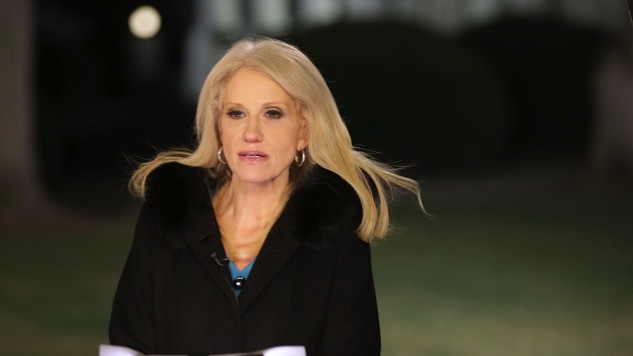 As if the Nunberg circus from last night wasn’t dizzying enough, the Office of the Special Counsel (unrelated to the Mueller probe) said on Tuesday that Kellyanne Conway violated the Hatch Act twice during cable news appearances while commenting on the Alabama special Senate election late last year. The first instance occurred in November on Fox & Friends, when she openly advocated for Roy Moore over Doug Jones, and the second occurred on Dec. 5 on CNN, when her appearance followed the same pattern. It remains to be seen what discipline, if any, Trump will levy on Conway. When she seemingly violated an ethics rule by openly endorsing Ivanka Trump’s clothing line on TV in Feb. 2017, she received a slap on the wrist and a talking-to from lawyers.